Exeter is situated in east Devon around five miles from the coast however it was once an important port on England's south coast. This thriving city lies on the River Exe which runs through the city and joins the coast at Exmouth. Exeter is a vibrant, modern city that now styles itself as the regional capital of the Westcountry - however its roots go back a long time, to Roman times and beyond. Situated on a small hill on a bend in the River Exe, the site of the modern day city has been occupied for over two thousand years. The Romans built a permanent settlement here around 50 AD to form the administrative centre of the region. The shape of the modern city is derived from this settlement and there are still significant parts of the old roman wall on display around the city. A thousand years later, in 1068, the walls protected the city from the invading Normans led by William the Conqueror. The city resisted the attackers for 18 days until the walls were breached and the city surrendered. The Normans then constructed Rougemont Castle from which to administer the region. The remaining part of this development now serve as the Court buildings for Exeter. 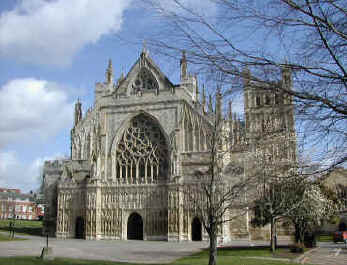 The Normans were also responsible for building Exeter's magnificent cathedral- St Peters. Built on the site of an existing church, St Peters was constructed between 1112 and 1133. The design was unusual for that time and is based on twin transept towers which support the north and south walls. The entrance is via the Great West Front which is decorated with many sculptures which were originally painted in bright colours. Inside there are many examples of medieval craftsmanship with the highlight being the stained glass of the East Window. Exeter has a long maritime history stretching back to Roman times. When the rivers of Britain were the main highways Exeter became a port with ships travelling up the river from Exmouth to offload produce in the city. The results of this trade can be seen at the quay area of the city where there is the Customs House and several old warehouses to be seen, mostly now converted to houses, shops and cafes. Sir Walter Raleigh who was born near Exmouth often frequented the city and Sir Francis Drake was a patron of The Ship Inn and Mols Coffee House both in Cathedral Close. Exeter also has a fine University, set in landscaped grounds over looking the city. The city has around 12,000 students at various institutions and as a result the bars, cafes and bookshops do a good trade and there is an energetic nightlife. Exeter Cathedral - 12th century Cathedral and Cathedral yard with shops, pubs and cafes. 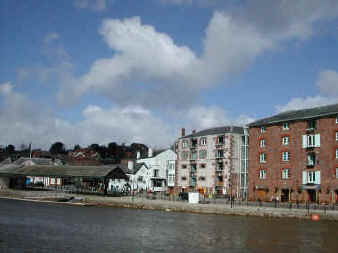 Exeter Quay - The old port area of the city now restored with pubs, cafes and shops. Also available are canoes, paddle boats and bikes to hire. Crealy Adventure Park - Amusements and adventure rides just outside Exeter. 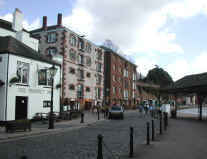 Cycle path - which follows the Exeter canal to the Double Locks pub and the Turfs Hotel. Alternatively you can go in the direction of Topsham and follow the track to Exmouth. There are a couple of river crossings via ferries which take bikes. Nearby and well worth a visit. A la Ronde - a National Trust property - follow the road to Exmouth.